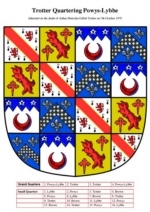 The obvious way to quarter the Powys-Lybbe arms by Trotter is to have a simple shield of four quarters, 1. Lybbe, 2. Powys, 3. Trotter, 4. Brown. But this would be wrong on account of the fact that both the P-L and the Trotter arms are impartibly quartered, each having had this done by Royal Licence; this means that they cannot be taken apart: P-L must be shown with precisely its four quarters and Trotter with precisely its four quarters as well. Of course if Powys-Lybbe and Trotter are included as part of a scheme of many more quarterings, each need only appear the once.